With many types of jobs in the knitwear sector, having MA Fashion Knitwear Design on my CV will add an extra level of curiosity to anyone who views it. What do you enjoy most about studying MA Fashion Knitwear Design? “The freedom to explore and experiment makes this MA most enjoyable. We are required to expand and push our knowledge on particular elements in knitwear, pushing innovation and experimentation of ideas. “Its reputation for successful and inspiring knitwear design was what motivated me to come to the UK. I graduated with a BA degree in Knitwear 2D Trend Forecast. I had explored many techniques and styles of knitting, but hadn’t had much opportunity to develop these techniques into finished garments. 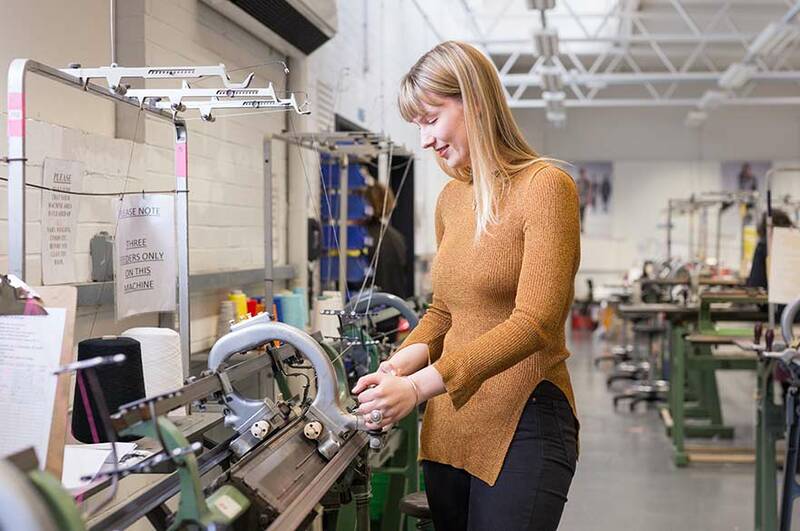 “NTU offers a wide range of knitwear facilities and technicians. Ranging from power knit machinery, to Dubied and Domestic machines, we have the freedom to experiment on all types of machinery. Why would you recommend your course to others? “The experience I have gained from completing MA Fashion Knitwear Design at NTU has provided me with further knowledge and confidence which will prove beneficial when looking for jobs in industry. “I have been preparing myself for the next step, to find a job in the fashion industry. The ability to specialise in this knitwear has allowed me to profile myself more specifically as a knitwear designer, knitwear developer or knitwear technician. With many types of jobs in the knitwear sector, having MA Fashion Knitwear Design on my CV will add an extra level of curiosity to anyone who views it.